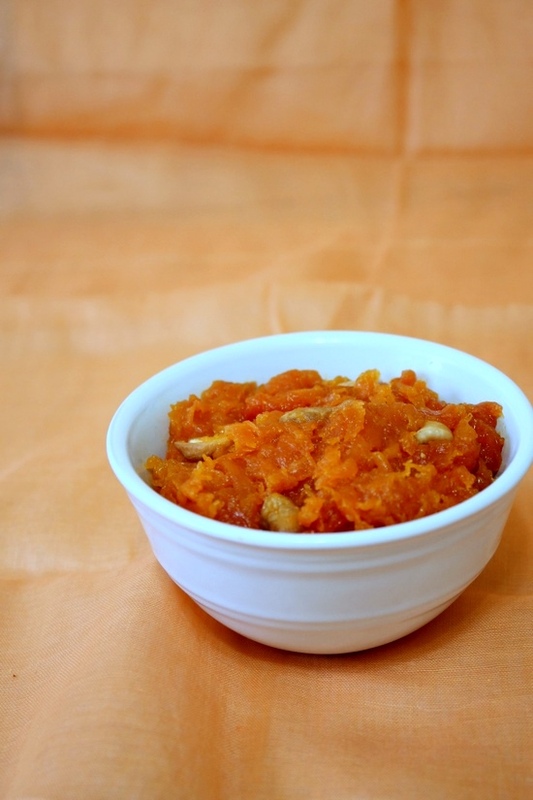 Papaya halwa recipe – Indian dessert made from ripe papaya fruit. It is flavored with cardamom seeds powder and garnished with cashew nuts. When it comes to the fruits, I and hubby always prefer to have it as such. I do like them in smoothies once in awhile. Other than that I rarely make any recipe using fruits. That’s why you don’t see me posting recipes made with fruits except beverages. Papaya is the fruit which hubby do not like at all. So it is always for me only. I had huge ripe papaya lying in the kitchen. I have cut up the pieces and stored in the container for couple of days for me. I know it was too much that I couldn’t finish by myself. and I do not want to throw any single piece. So I have made this papaya halwa and still I had few leftovers. With those I have made papaya muskmelon juice. 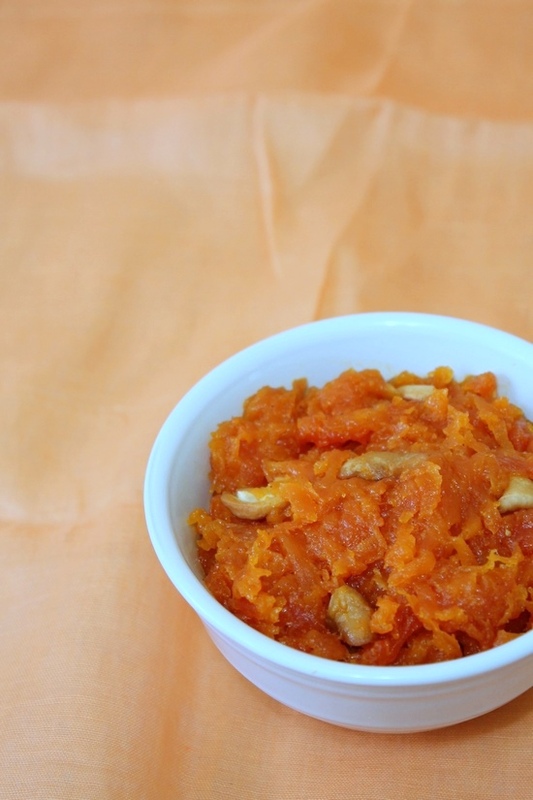 This papaya halwa is healthy sweet recipe compared to other halwa. Because here I have used very ripe papaya which is already really sweet. So I have added very less sugar in it which makes it low in calories and healthy. Also I have used very little milk while making papaya halwa. So the halwa is light on stomach, yes not heavy at all like Indian sweets. If you want to make it rich, you can add milk powder or khoya or heavy cream instead of milk. Papaya fruit is called ‘Papita’ in Hindi. 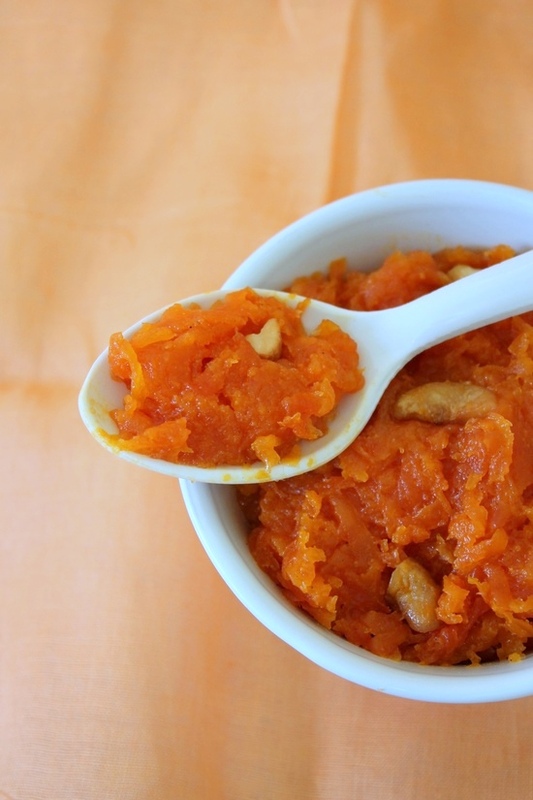 So you can call this dessert papite ka halwa recipe. First time I have made papaya halwa was about an year ago. That time I took the photos as well. But I forgot about it and the folder was buried under and never got the chance to post it here. About a week back I was cleaning the hard drive and found the photos. I thought this is the perfect time as Diwali festival is going on, I should post something sweet recipe. 1) Take ripe papaya. Wash the papaya well. Cut into half then remove the seeds and peel it. Also cut and discard the top and bottom port (Pith/stem). 2) Cut into large pieces and start grating them using the box grater. You can use food processor as well. 3) Heat 1 tablespoon of ghee in pan on medium heat. Fry the cashews till they are golden brown. Drain it and remove it to a separate bowl and keep it aside. 4) In the remaining ghee, add grated papaya. 5) Mix well and keep cooking till all the moisture is evaporated. 6) It took me 10 minutes. Do stir once in awhile. 7) Now add sugar and milk. 8) Mix well. As sugar melts and because of milk addition, it will become runny again. 9) Continue cooking with stirring occasionally. 10) Cook till it is dry and gets halwa consistency. 11) Now add 1 teaspoon of ghee. 12) Mix it well and turn off the stove. 13) Lastly add fried cashews and cardamom powder. 14) Stir well. Halwa is ready to serve. Serve papaya halwa hot or warm or chilled. Serving suggestion: Serve as a dessert after or during the meal. Or enjoy it anytime whenever you feel like. Instead of grated papaya, you can chop them into small pieces and mash them during the cooking process to get the halwa consistency. The sugar quantity is adjustable. taste the papaya before making halwa and add sugar accordingly. If your papaya is more sweet then you need less sugar. If your papaya is semi-ripe then you will need more sugar. Yes you can make this halwa with semi-ripe papaya as well. The taste will be different but good. Take ripe papaya. Wash the papaya well. Cut into half then remove the seeds and peel it. Also cut and discard the top and bottom port (Pith/stem). Cut into large pieces and start grating them using the box grater. You can use food processor as well. Instead of grating, you can chop them into small pieces and mash them during the cooking process. Heat 1 tablespoon of ghee in pan on medium heat. Fry the cashews till they are golden brown. Drain it and remove it to a separate bowl and keep it aside. In the remaining ghee, add grated papaya. Mix well and keep cooking till all the moisture is evaporated. It took me 10 minutes. Do stir once in awhile. Now add sugar and milk. Mix well. Continue cooking with stirring occasionally. Cook till it is dry and gets halwa consistency. Now add 1 teaspoon of ghee. Mix it well and turn off the stove. Lastly add fried cashews and cardamom powder.